Hello everyone! Still alive, still in a lot of back pain, still with a lingering cold. So here is another quick eating out post, from a while ago. My friend Taylor was visiting from Melbourne, and we arranged to meet up for dinner at Vegeme in West End. I always enjoy meeting up with Taylor, we end up having the most fascinating discussions. He is an amazing intersectional vegan. We ordered food to share, and picked a few things off the Small Bites menu. The radish cakes ($5.90) were yummy, as always. 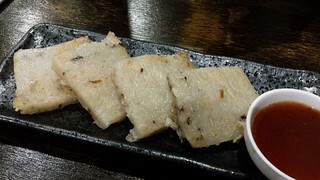 I think radish cakes are one of my favourite things ever. 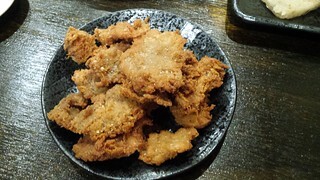 We also had the Deep-Fried Suji with Salt and Pepper ($5.50), which I am pretty sure is Lamyong Salty Crispy Chicken... so it was pretty yummy. Finally, we had the Boiled Dumplings ($8.50), because Taylor wanted to try them over the pan-fried ones (strange I know). They were quite nice, but the pan-fried are definitely the best. 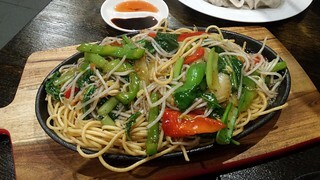 We also got the Sizzling Noodle ($12.00) to share, which was a sizzling plate of noodles and veggies in black pepper sauce. It wasn't the greatest. Kind of dry, not enough sauce, not enough flavour, a lot of capsicum to pick out, and sparse on the other veggies. I wouldn't get it again. And then we both got some pan-fried dumplings ($8.50) to take home for our respective parents, because we are good children. I'm off to Melbourne again on Thursday for some real fun food times, so I look forward to sharing those with you! This is Beetle and Lucy Lou, who are both up for adoption. Beetle is a teeny tiny black fellow, who is very serious and loves Lucy Lou like she is his mum. Lucy Lou is a sweet little girl, who loves to snuggle and to eat. It would be super lovely if they could go together! Call 07 3367 0011 if you think you are in Brisbane and think they might be a good fit for you! I got back from Melbourne a week ago, though I've been struggling with an injured back and head cold of death since then. I was in Melbourne just for the weekend to work at OzComicCon, as I do, so there wasn't much time for a lot of food. However, there was some food! Flying out from Brisbane, I of course had to stop by Doughnut Time at the airport for a doughnut. 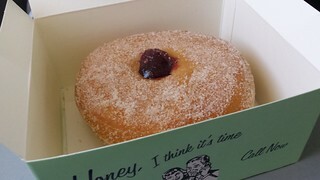 In happy news, they have made their jam doughnuts permanently vegan. Cinnamon sugar dusted and filled with raspberry plum jam, they are pretty great! Though my favourite is still the blueberry one they used to have. We got in on Friday afternoon just in time for me to grab a few grocery supplies before the walk through for the venue, then it was back to the hotel to get ready for the cocktail party. Our hotel was in the Southbank region of Melbourne. I do not recommend staying in this location, there is nothing and it is not near The Food. Well, there is actually one veg*n restaurant that was quite near the hotel, but it was closed for two weeks so wasn't open while we were there. One of the other guest handlers who was staying at the same hotel (we were split between two this con) is recently vegan, so we decided to get some food. After getting ready for the cocktail party (my dress was super cute, I wish I had a photo), we caught a cab (it would not have taken long to walk, but it was raining) to... Lord of the Fries. If you've read my previous thoughts on LoTF, it has ranged from being meh to downright not great. But it was nearby and we just needed something. 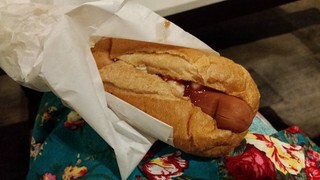 I decided to order the vegan Melbourne Hot Dog (cheese, onion, tomato sauce, mustard) and a kids size of classic fries with vegan French Canadian sauce (gravy and cheese). There is nowhere to sit at the Flinder's St LotF, so we decided to go and eat in the lobby of the hotel where the cocktail party was. The heavens opened and we got kind of wet. Maybe it was the fact we were cold and wet and hungry, but the food was... pretty good! 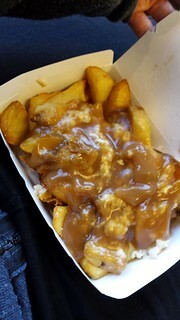 Particularly the poutine fries (though the fries themselves were not that great). My photo of the fries was super blurry, but enjoy this photo of the hot dog perched on my lap (see a glimpse of how pretty my dress is). The next morning I had a banana and a cucumber and hummus sandwich (I had brought it down for the plane trip the day before but didn't end up eating it) before a brisk and freezing 10 minute walk to the venue. Emergency socks became essential socks. The venue supplied fruit salad as the vegan breakfast option, but it was served in the tiniest little glass cup ever. About six pieces of cut fruit. Good thing I always eat breakfast before I go! The day was spent looking after my guest, who was an absolute delight, and munching on some snack bars and bananas and juices I had brought along with me. This OCC, for the first time, the venue had two vegan options for lunch. I ordered the Grilled Veggie Wrap, which was a sad and soggy wrap with soggy grilled veggies (so much capiscum to pick out) and a dried on schmear of hummus. They actually screwed up heaps of the lunch orders, so they had to go and chase this down for me. A sorry state of affairs. After we finished for the day, I headed into Fitzroy (where all the food is) to meet my friend for dinner at Fina's 2, a vegan Vietnamese place that I had been wanting to try. 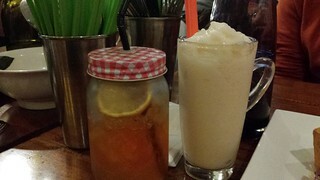 We both ordered drinks - Jess had a lemon iced tea, and I had a custard apple smoothie (I asked them to cut way back on the soy condensed milk... you can ask for more or less of any ingredient, which is great!). I was particularly excited for the custard apple smoothie, as when I was younger there used to be a Vietnamese place in a shopping center near me that had the most delicious custard apple juices. 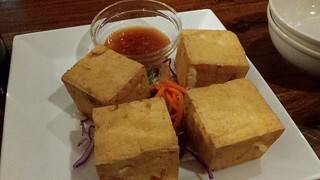 I was pretty hungry, so we started off with the Vegan Crispy Tofu - four huge and perfectly crispy fried pieces of soft tofu with sauce. It was great. We decided to share our mains. 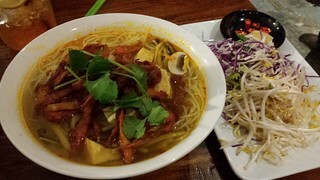 We got the Vegan Bamboo Soup and the Vietnamese Pancake. Jess had warned me that sometimes the pancake could be a bit coconutty to some people, but other times it wasn't. 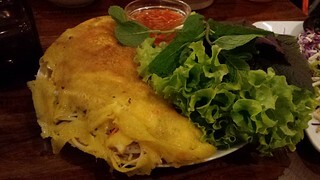 It was a glorious and large pancake, but to me it did have that unpleasant coconut fat taste in some bites (not all), so Jess ate most of it. Which meant I got most of the soup, which was by no means tragic as it was delicious - noodles, tofu, mock duck and bamboo in an amazing broth. So good! Unfortunately all their desserts were raw and full of coconut oil, so a no go for me. 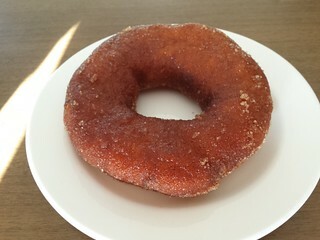 But it was OK because Jess had brought me some cinnamon sugar doughnuts from Crumbs, who make the best doughnuts ever. Sadly their North Melbourne branch had closed the very day before, which is why Jess brought me some. They still have their Ascot Vale flagship, though it is not close to the city. 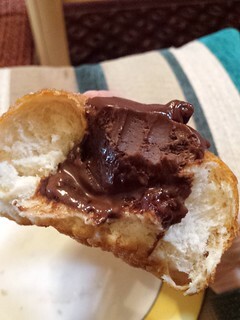 I ate one of the doughnuts as soon as I got home, and then I had another one the next morning for breakfast along with one of the muesli cups I had brought with me. Then it was off for another day of OCC. I was looking after a different guest today, who was also lovely. Unfortunately I was pretty sad as I had hurt my back the night before. It was so cold... so very cold... and when I get that cold I start shivering violently. I have been to a physio since I have been home, turns out I actually sprained the joints where my ribs meet my spine. All I knew on Sunday was that I hurt like hell. It was another day of a tiny fruit cup, juice and bars. The venue's lunch was veggie rice paper rolls. They were okay, but the whole lunch was just two tiny rolls. Luckily I had packed a McDougall's Garlic Noodle Soup cup that I had as well. I am always prepared with food! After the event finished, we stay behind to help pack down. But I was in a world of hurt from my back and apparently looked it, so my vegan friend whisked me away in a cab a little early for some hot food before bed. We went into the city to Gong De Lin. It is a little hard to find, being up on the third floor or a little side building, so I was glad she knew where we were going! They have an extensive menu, though it is very heavy on the mock meat. I jut really wanted tofu and veggies, and I struggled finding it on the menu. 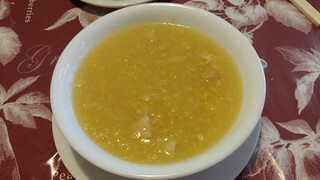 I started my order with a nice little bowl of sweetcorn soup. Janelle had the salt and pepper calamari, which I tried a piece of. The seasoning was good, but faux seafood is not my cup of tea. 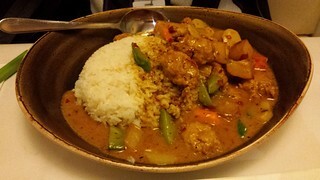 She also ordered the chicken curry and rice special, which was huge! The chicken was nice, but the curry was a bit too spicy for me! 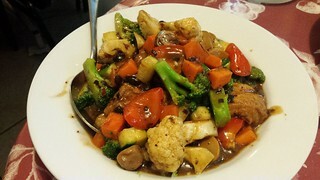 I thought I had found my happy place by ordering the Fragant Tofu Clay Pot and some rice, though when it came out I discovered it was some tofu and veggies in sauce... with heaps of faux seafood! I picked all of that out and gave it to Janelle to eat. The tofu and veggies that remained were OK, I was hungry and they were hot. I have realised that I forgot to take a photo of my hot pot! I must have been too shocked at all the frawns. Ha! Then it was back to the hotel for a hot shower and falling asleep on my heat pack (which by some miracle I had decided to pack at the very last minute). The following morning we were all flying out late because one of the organisers was having their 40th birthday party at a hotel in the city. 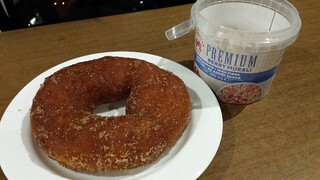 I started my day with some overnight oats and my final, delicious Crumbs doughnut. We had all woken up to the horrifying news about the massacre in Orlando, and one of the handlers had lost a friend there. So it was a little surreal to be off to a 40th birthday party. It was actually an extremely silly party that was very lovey. It included Glitter Bomb Q&A Pass The Parcel (the birthday boy had to answer questions about the people who had the parcel when it stopped, and if he got it wrong they got to shower him in glitter... it was really fun) and other silly games. Other than a fruit plate, there was no vegan food. It was also a public holiday in Melbourne, so a lot of places were closed. So we went back to Lord of the Fries. And I admit, I was feeling optimistic. I ordered the vegan Original Burger (cheese, pickles, lettuce, mayo, mustard, ketchup, beefy patty... hold the onion), and a kid-sized Chunky Chips with vegan gravy and cheese. 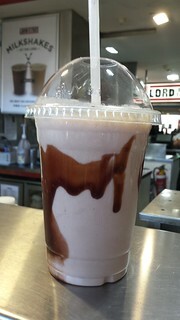 I also got a peanut butter milkshake. I'd skip the milkshake next time, it was just kind of thin and nowhere near peanut buttery enough (they also have Oreo flavour). But the burger was satisfying and the fries were good... chunky fries are definitely the way to go. Vegan French Canadian sauce is also the way to go. I did have this the very first time I had LotF, but it was on an assorted munch box of deep fried that left me feeling icky. Potatoes, gravy, cheese... don't mess with this formula for success. So, LotF has left my bad books. It is not exactly in my great books. It is in my 'happy to eat it if there are no other convenient options' books. Which is a step up! Then it was off to the airport for the flight home. 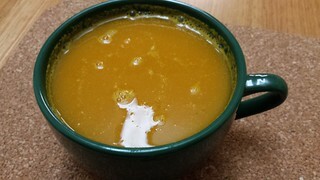 I grabbed a couple of sushi rolls to take on the plane for a snack, and when I got home my mum had made some vegan pumpkin soup. Just the thing to enjoy before having to jump into bed for work the next morning. This was not a typical trip to Melbourne, in that food was not the primary goal. It was a bit sad not having a chance to get to my favourites (Smith & Deli, I love you), but it was also nice to try a couple of new places. The good news is that I am going back to Melbourne in a week and a half, with the goal of eating all of the food. Also to see RuPaul's Battle of the Seasons and to see dinosaurs at the museum. But there will be heaps of food. Though it will be even colder. So. Many. Layers. I have mentioned my love for Neko Atsume before, the cute little cat game that you play on your phone. I have been looking for NA merchandise in Australia for a long time, without success. 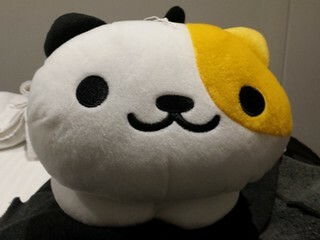 On Friday as I was walking around the venue during set up, I happened to notice a stall that had a few plush NA kitties! I was giddy with glee! They offered to put one aside for me, but I ended up going back with cash and saying I could take her home right then. They had my favourite kitty! In the English version her name is Sunny, but I played the Japanese version and have named her Berry. She is perfect for hugging. 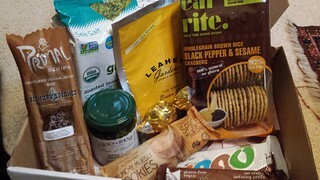 The final box of my six month CFS Mystery Box subscription has arrived! What's in the box? Primal Strips Hickory Smoked Jerky: I am a big fan of these as a handy snack on the go, and this one is my favourite flavour. Gimme Organic Roasted Seaweed Snacks in Sea Salt: I have long been a fan of snacking on seaweed, but sometimes flavoured seaweed that is egan friendly can be hard to find. I've had these before and they are nice. Leahey Gardens Beef-Style Gravy: I've had this before as well. It is very quick and easy to make when you are after a simple, beefy gravy. Coming into winter, gravy will be on the menu. Eat Right Wholegrain Brown Rice Black Pepper and Sesame Crackers: I haven't tried these before, but am always keen to try new crackers. Vego Bar: These have recently hit Australia, though I have had one before thanks to international friends. Everyone is very excited, and many people rave about them. I think they are OK, but they are a bit too sweet for me. Story of my life with chocolate! GoMaxGo Buccaneer Bar: Speaking of sweet, the last time I had one of these bars it actually made my teeth hurt from the sweet. Why so sweet GoMaxGo? Thankfully I have a friend who is into them, so she shall be getting a chocolate bar! Munchie Muesli Cookies Cinnamon Spice: I am pretty excited to try these little snack cookies. I hope they are good! Olio and Pane Basil Pesto: I tend to find jarred pesto too oily for me, but can use them in little doses. I have had some of this before. I actually still have a jar of this in cupboard from a year ago. Need to use more pesto. Constant Craving Jaffa Truffle: I love these truffles, and this is my favourite flavour! A recipe for lentil and walnut loaf (from Oh She Glows) to use with your gravy... I already have this recipe because I have this book! (Note, I just checked their website and I see that have updated it to say 8-10 vegan items, so this covers the recipe not being included as an actual item). It has been a fun six months, but I don't think that I will continue the subscription on my own for the remainder of the year. I feel kind of bad not continuing it, though. I have an overactive guilt reflex. Next Christmas I will likely get another six months subscription as part of my present. I'm off to Melbourne this weekend for another round of OzComicCon. Eating adventures will be limited by actually having to work at OCC, but there will be some food to be had. The venue is also provided a non-fruit salad vegan option for lunch for the first time in my OCC experience! I shall report back. Meet Jimmy Barnes! 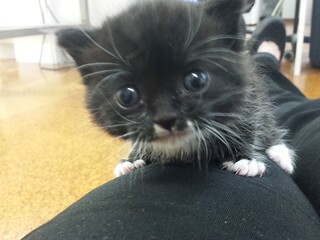 Jimmy Barnes is a teeny tiny kitten surrendered to our main clinic. He is being hand raised by the nurses, and is super cute! I hope all my fellow Briskids are staying dry on this exceptionally rainy Saturday we are having here today! And what better thing to dream about on a rainy day than a big pile of doughnuts? This follows on from my previous two posts about my exciting Gold Coast food day with Amy! 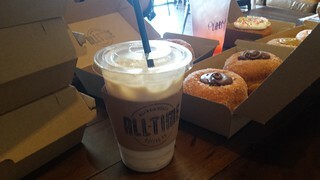 Between lunch and dinner, we stopped in at All-Time Coffee Co to pick up some doughnuts. 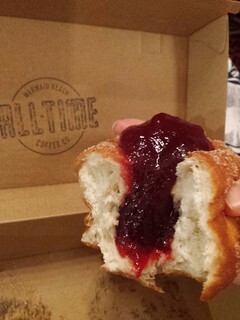 I had been hearing a lot about these doughnuts, and was super excited to try them. They sell out quickly, and were all gone by the time we got there, but we had pre-ordered some for ourselves. They have a selection of vegan doughnuts every day! Though I think that they are not all vegan, so be sure to check. 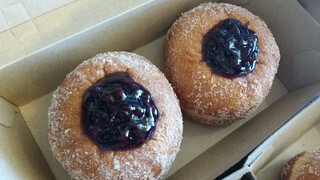 I got a half-dozen, with two each of Notella, Jam and Blueberry. 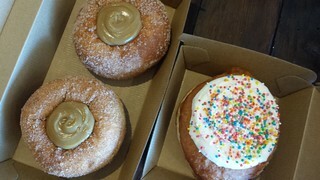 Amy also got these flavours, but with the addition of Fairy Bread and Salted Caramel. 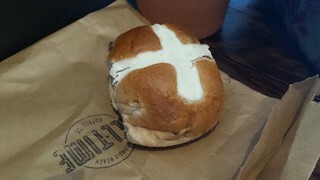 I also picked up an iced soy chai there, as well as a hot cross bun (this was just before Easter). Amy also got a Pink Lady and Raspberry Soda. 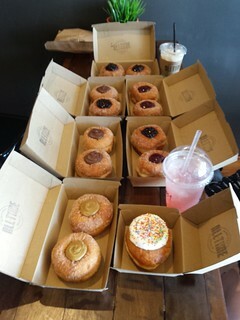 Want to know what a table full of doughnuts looks like? How about some inside shots? These doughnuts are large and do not skimp on the filling! 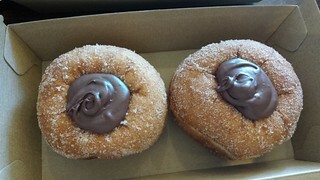 These were some good doughnuts! My favourite was the blueberry. The others were good, but the Notella is quite rich and heavy, and the jam is fairly sweet. The blueberry was a little bit tart and perfect. If you are heading down that way, I highly recommend emailing them to pre-order! Where has the last week gone? I didn't realise it had been a full week since my last post... and unfortunately the reason for it is nothing exciting, just my long week at work. Oh well, food time! This post follows on from my previous post. After Amy and I went to yum cha for lunch, we went and picked up some doughnuts (more on that in the next post), went and saw Zoolander 2 (not as good as original Zoolander), and rambled around some shops until we thought we were able to face dinner. 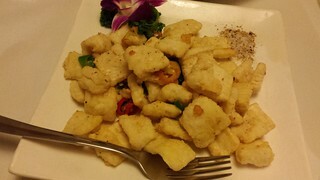 For dinner we went to Tian Ran, a Chinese vegan restaurant. 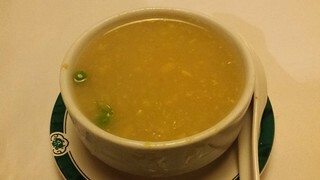 We both started with some Sweetcorn and Chicken Noodle Soup ($4.80), which came as big servings. It was so delicious that I accidentally burned my tongue on it because I couldn't wait for it to cool a little! 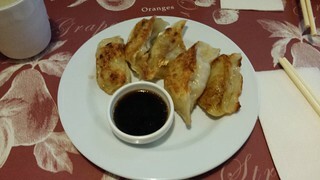 We also had some Pan-Fried Shanghai Dumplings ($4.50), which were nice. 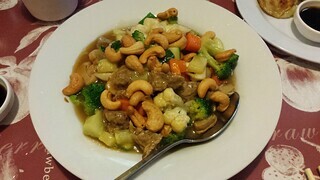 Amy had Beef and Cashews for her main ($13.80), and I had Fried Tofu in Black Bean Sauce ($12.80). I love their black bean sauce, so good! Amy ate all the gross capsicum for me, and I tried a bit of hers. 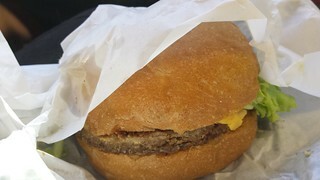 Their beef is very nice, I think it has mushroom in the base. 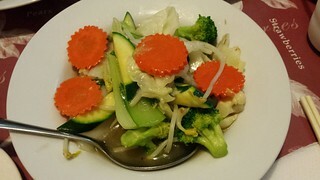 We also shared some Combination Vegetables ($9.80) as well. We did our valiant best, but we were clearly still a bit full from yum cha, and both ended up getting a takeaway container (which meant we got to have leftovers for lunch that week, so yay!). Tian Ran used to be only open for dinner, but now it seems that they are open for lunch as well! Though I recommend yum cha for lunch, Tian Ran for dinner. Make the most of it! If you are less sun-phobic, there are lots of beaches to frolic on to help you digest between lunch and dinner. Just remember to stay between the flags! In my last post, you met Neil de Cat Tyson. 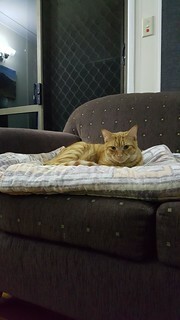 He was Amy's first cat. 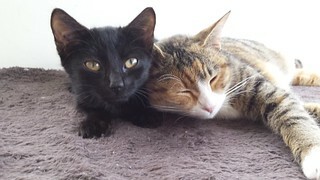 Shortly after Neil came home, Amy adopted a sister for him. 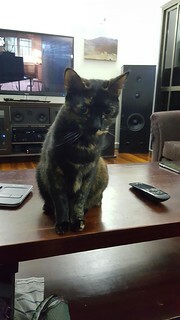 This is Cat Sagan.